Kingsman is a spy-hero action-comedy, directed by Matthew Vaughn to a screenplay by Vaughn and Jane Goldman. I confess that when the Kingsman’s previews were playing at theaters, months prior to the movie’s release, I was skeptic as to seeing it. Though the coming attractions were amusing, I did not fathom I would much enjoy this production. Coming with very low expectations, Kingsman was a pleasant surprise. If you feel like tasting a summer movie regardless of the weather outside, Kingsman is a good choice. Thought filmmaker Justin Simien claims Dear White People is not about racism but rather about identity and how a person understands themselves to be, there is no denying that skin color plays a major part in the story. Dear White People is a satire about the relationships between Caucasians and African-Americans at an Ivy League college. While I find plenty of issues with Dear White People is it still a daring and noteworthy film, and a promising debut for filmmaker Simien. Written and directed by Talya Lavie, Zero Motivation (original Hebrew film title is Zero in Human Relations,) is a gem. Presenting a wide range of topics, the film’s language is crude yet anything but stupid. It portrays several female Israeli soldiers, serving in a remote desert base, trying not to lose their mind out of boredom until their time is up and they can return to civilian life. This comedy-horror film, written and directed by Seth Rogen and Evan Goldberg, has some very funny moments. But what starts as a fresh comedy quickly becomes redundant and somewhat tiring. 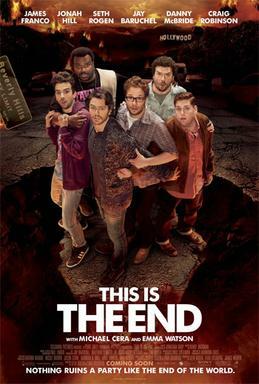 Bottom line: if you've enjoyed Pineapple Express, Superbad and the likes, you may enjoy This Is the End. Otherwise, find something else to watch.